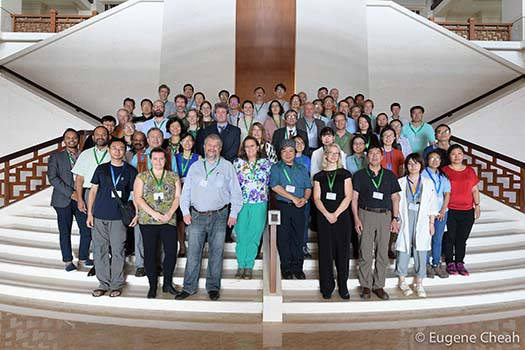 Over 85 participants from 20 countries and over 60 organizations flocked to the Arctic Migratory Birds Initiative (AMBI) East Asian-Australasian Flyway Implementation Workshop in Hainan, P.R. China December 5-8, 2018 ahead of the EAAFP 10th Meeting of the Parties. The Arctic Council’s Conservation of Arctic Flora and Fauna (CAFF), in partnership with the Department of Wildlife Conservation, National Forestry and Grassland Administration of the P.R. China and the Forestry Department of Hainan Province, held the workshop to advance work on the issues of habitat conservation and illegal hunting of migratory birds along the flyway. This was the first Arctic Council event in P.R. China, and brought together government representatives from environment and natural resources departments as well as foreign affairs departments in addition to key conservation organizations in the region. During the meeting AMBI consulted with countries and organizations to finalize its draft 2019-2023 Work Plan for submission to the Arctic Council. The meeting also highlighted the work of governments and organizations to advance conservation issues such as habitat protection and restoration, the development and implementation of species and habitat management strategies, and efforts to better understand and reduce illegal killing and hunting as they pertain to AMBI priority species including the Spoon-billed Sandpiper, Red Knot, Great Knot and others. It also showcased key activities and products that have helped advance conservation in the region. CAFF is the biodiversity Working Group of the Arctic Council, a high-level intergovernmental forum promoting cooperation, coordination and interaction among the Arctic States, Arctic indigenous communities and other Arctic inhabitants on common Arctic issues of sustainable development and environmental protection in the Arctic. Work at the Arctic Council is conducted by the Ministries of Foreign Affairs in consultation with relevant federal and territorial bodies. CAFF’s mandate is to address the conservation of Arctic biodiversity, and to communicate its findings to the governments and residents of the Arctic, helping to promote practices which ensure the sustainability of the Arctic’s living resources. It does so through various monitoring, assessment and expert group activities. One such assessment, the Arctic Biodiversity Assessment (2013) noted that “Many Arctic migratory species are threatened by overharvest and habitat alteration outside the Arctic, especially birds along the East Asian flyway,” and launched AMBI as a response in 2015. Since then AMBI has been working with Arctic governments, in particular, Russia, Canada, U.S and Norway, as well as Arctic Council observer states in Asia, in particular Singapore, Japan, P.R. China, Republic of Korea and India, and other partners, to improve the status and secure the long-term sustainability of declining Arctic breeding migratory bird populations along the East Asian-Australasian Flyway and three other global flyways. In 2013 CAFF and EAAFP signed a Resolution of Cooperation in to better coordinate efforts to promote and protect birds along a migratory flyway, and CAFF is an Intergovernmental Partner to the EAAFP. AMBI is grateful to our Chinese hosts and to all participants for their continued cooperation on the project. Following the publication of its new Work Plan 2019-2023 (anticipated in mid 2019) AMBI looks forward to continue working with ever-expanding numbers of partners to advance common goals for Arctic-breeding migratory bird conservation.